With over 70,000 control sessions, the robotic arm has 2 stripped clutches and 1 gear that has been completely polished clean of all of the teeth. Repairs are being made and the arm will be back up soon. How does it work? - Really quite simple! 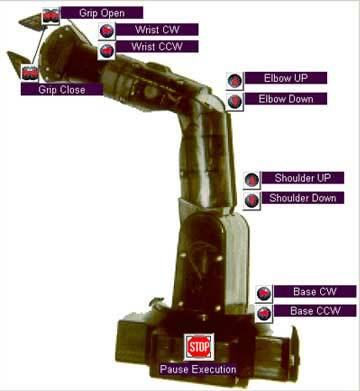 The Robotic arm is the OWI 007 Robotic Arm Trainer with the 007 / PC Arm Interface. The Webcam is an Ezonics cam with a Java interface for viewing. This project was designed to be 1. CHEAP and 2. EASY! I think I have the cheapest internet controlled robotic device on the planet! The EASY is very easy: The Code is very simple, there is a single line of dynamic code that executes every movement, and a meta refresh that stops the arm after 5 seconds of movement. Build time- about 4 hours to build the Arm from kit form, 1 hour to play with the arm and learn how the PC interface worked, another hour of playing ;-), and about 10 minutes of code time. There is no need for CMMS, maintenance software or other software products to operate the robotic arm. If you were building a much bigger industrial robotics you should consider some CMMS software to manage the operation. Base can rotate left and right -350 degrees. Shoulder moving range - 120 degrees. Elbow moving ronge - 135 degrees. Wrist rotate CW and CCW - 340 degrees. Gripper open and close- 55 mm (2.2 inches) - 0. Product Dimensions- Maximum length outwards - 360 mm (14.2 inches). Maximum heights upwards- 510 mm (20.1 inches). Lifting Capacity- Maximum 130g (4.6 oz.) Power.